Blog Join the 2018 team! Are you passionate about LGBT equality? 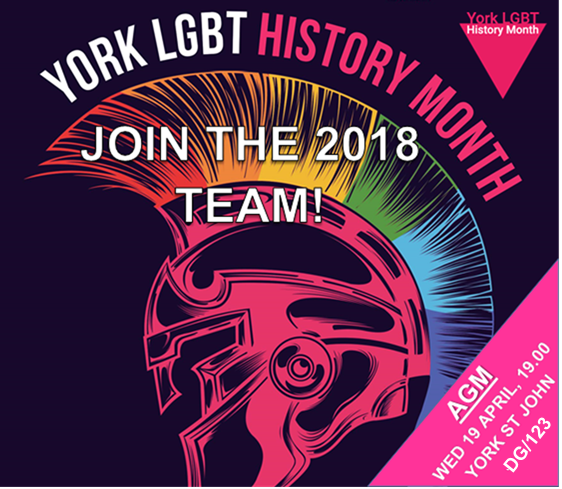 Would you like to volunteer with a local charity and help us coordinate a fabulous programme of events for York LGBT History Month 2018? If you’re interested, we’d love to hear from you! All positions are open to both LGBT+ people and allies, and all can be shared between more than one person. Our AGM will take place on Wednesday 19 April at 19.00 in DG/123, De Grey Building, York St John University. If you can’t make it but would still like to stand for a position – or if you’d like to discuss anything – please email our outgoing Lead Coordinator Kit.